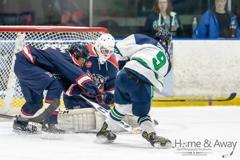 With the only blemish on the Whalers Elite teams schedule coming at the hands of the Richmond Generals in the 3rd and 4th games of the season in Richmond, the boys had plenty of motivation in this weekend’s re-match. The Whalers looked solid through 2 periods, building a 3-0 lead, but the Generals mounted a furious rally to tie the game 3-3 in the 3rd period. 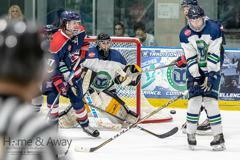 It took the Whalers all of 17 seconds into overtime to right their wrongs and take game one 4-3. 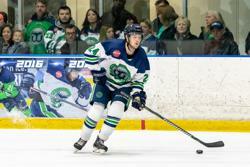 Arun Cibrario, Nate McNamara, and Mark Strazisar scored for the Whalers in regulation while Ruslan Abyanov was the OT hero. DJ Randle tallied 3 helpers, with Matt Scicchitano, Kyle Ball, and Ruslan Abyanov each collecting 1. Ross Jones won his 6th start in a row in net with 26 saves. 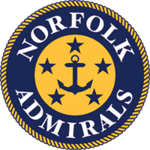 Hampton Roads held a 30-29 edge in shots. The Whalers finished 1 for 8 on the power play while the Generals were 0 for 5. Cody Wilson and Michael Bachman each missed the game, serving one game suspensions. Coming off another weekend sweep, the Whalers Premier team came out flying against Richmond, scoring 3 times in the opening frame to take a 3-0 lead after 1. In the 2nd period, the Whalers let off the gas and the Generals resilience paid off with 2 quick goals to narrow the gap to 3-2 after 40. 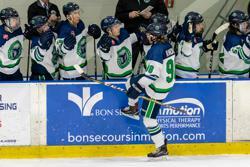 The Whalers were able to tack on another goal in the final frame to take the win 4-2, their 18th straight. Brandon Osmundson scored twice, while Brady Mistler and John Moncovich each scored once. Conner Hunt, Oliver Freden, and Matthew Hanchon each picked up one assist. Alec Lindberg picked up the win in net with 26 saves. Hampton Roads held a 44-28 edge in shots. The Whalers finished 0 for 4 on the power play while the Generals were 0 for 3. The 2nd game of the weekend continued to be a closely contested battle between these two I-64 rivals. Once again the Whalers jumped out to a 2-0 lead, but the Generals quickly responded to tighten the gap to 2-1. In the 3rd the Whalers quickly made it 3-1, before the Generals would again answer to make it 3-2. 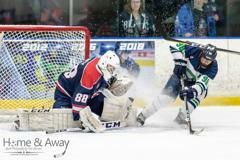 The Whalers extended the lead late in the 3rd to 4-2 and battled through a 5 minute major penalty kill to hold on for another 4-3 win, the teams 16th win in a row. Mark Strazisar, Michael Bachman, Liam Smiley, and DJ Randle scored for the Whalers. DJ Randle, Tanner Davis, Bryce Leger, and Mark Strazisar each notched 1 assist each. Ricardo Alvarez improved to 6-1 in net with 26 saves. Hampton Roads held a 35-29 edge in shots. The Whalers finished 0 for 4 on the power play while the Generals were 2 for 9. Ruslan Abyanov was ejected for the Whalers. 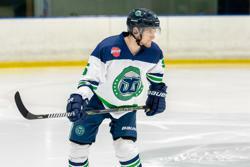 After an incredible 18 game winning streak to start the season, the Whalers Premier team’s momentum came to a screeching halt on Sunday afternoon. The Whalers started slow, allowing three 1st period goals, and never were able to find their rhythm, while allowing 3 power play goals, as they fell for the 1st time this season, 6-5. John Moncovich tallied 2 goals, while Nolan Cavanagh, Oliver Freden, and Jaxon Rutkowski each had 1. Brandon Osmundson and Oliver Freden each notched 2 helpers, while Jared Sanchez, Brady Mistler, Jaxon Rutkowski, and Brandon Leitz each had 1. Blake Bjella started the game, allowing 3 goals on 13 shots, Alec Lindberg took the loss in relief with 3 goals against on 23 shots. Hampton Roads held a 42-39 edge in shots. The Whalers finished 3 for 8 on the power play while the Generals were 3 for 6. After a stretch of 20 games that saw a stretch of 14 straight on the road, the Whalers will get a much deserved off weekend before a trip to Charlotte and a meeting with the Rush just before the Thanksgiving break. Those games will represent the halfway point of the 2018-19 USPHL season. Catch all the action live on HockeyTV. 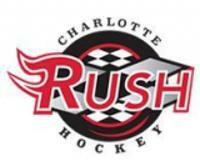 All games will be played at the Extreme Ice Center in Indian Trail, NC. Premier Forward Brandon Osmundson, Elite Defenseman James Rowe, and Elite Goalie Ross Jones took home USPHL Player of the Month Honors for their performances in the month of October. Additionally, Osmundson was named USA Jr. Hockey Magazines Tier 3 Player of the Month. Premier forward Max Loga made his NCAA commitment to Lebanon Valley. The Whalers Elite (18-2) and Premier (18-1) teams continue to lead the way in the USPHL as they sit atop both the southeast division and overall league standings. Additionally, of the 141 Tier 3 teams, the Premier team ranks #1 in the country in winning percentage while the Elite team ranks 5th as of the week of 11/5. 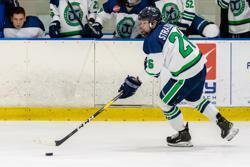 Whalers Elite forward Mark Strazisar will represent his home country of Slovenia at the 2019 IIHF U20 World Championships in December in Poland. Mark will become the 8th Whaler to represent his home country on the international stage. Alumni forward TJ Sneath took home UCHC player of the week honors after scoring a hat-trick in the season opener for Lebanon Valley. Last week was a big weekend for a pair of Whalers alumni at Utica College. Goalie Sean Dickson picked up his 1st career NCAA win and forward Regen Cavanagh scored his first 2 collegiate goals and 1st star of the game honors as the Pioneers knocked off Manhatenville.